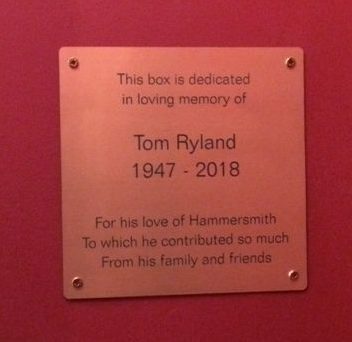 As part of the refurbishment of the Lyric, Hammersmith BID, – the Business Improvement District group of which Tom was a board member – took the opportunity to sponsor and dedicate one of the Main House boxes to Tom, and the unveiling was held on 29 October. The dedicatory plaque and box are shown, with Liz Ryland seated in the foreground – the box itself is a delightful feature of the theatre’s Victorian interior. It is a very fitting memorial to Tom, who greatly enjoyed the theatre and was very supportive of the Lyric. As one of the ways in which The Hammersmith Society will be commemorating Tom, we plan to erect a bench dedicated to him at a location along the Hammersmith riverside. We know that among the members of the Society there were personal friends of Tom’s, and if you would like to make a donation to the cost of the bench, do please contact Melanie Whitlock (ku.gr1556186613o.yte1556186613icosh1556186613timsr1556186613emmah1556186613@namr1556186613iahc.1556186613eciv1556186613). This year’s award nominations are open – winners of awards and wooden spoons will be announced at the AGM at the Bush Theatre on 5th July. Please do nominate your choice – see our awards page to understand the process and the various award categories, and review the list of existing nominations which are being added to the website as they come in. Nominations close on 16th May. It would help us if you can send us a photo with your nomination. No this is not another football club! How many of you have heard of the Hammersmith United Charity or know of the amazing work that it does? In fact there are two sister charities which have both been operating for 400 years in Hammersmith and Fulham. The one in Fulham is called Dr Edwards and Bishop Kings. To celebrate their success, they want to unite and set up another charity which they will call UNITED. The objects would be ‘to bring people together (young and old, rich and poor, existing residents and newcomers, diverse communities, people with and without disabilities), enhance connections as neighbours and colleagues, and build a sense of belonging, resulting in meaningful and sustainable outcomes’. The initial objective is to raise a £1million fund and a large part of this has been achieved.